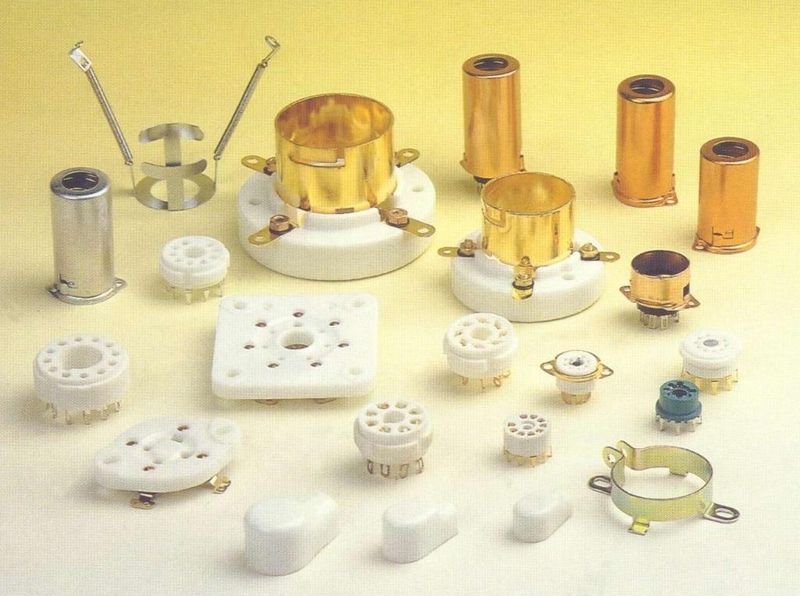 Our factory is specialized in producing radio terminals and connectors such as 4-pin, 5-pin, 6-pin, 7-pin, 8-pin, 9-pin, and 12-pin vacuum tube'ssockets with its products exported early in 1970s to Southeast Asia,Europe,America and other places. The factory possesses modern and advanced equipments of high efficiency and automation together with strong technical force, state of the art technology as well as complete sets of testing andinspecting instruments. As the most ideal accessories for electonic products also with great potential to be developed, our sockets and connectors enjoy good reputation at home and abroad. So welcome new and old customers for further business cooperation. TUBE SOCKETS INTRODUCTION Tube sockets were ubiquitous in early electronic equipment to allow vacuum tubes (also known as valves) to be easily removed for testing and replacement. Tubes often failed because the filament burned out, but other failure modes were common. In the heyday of radio and early television, it was common to find a vacuum tube tester in local drug stores, which also sold replacement tubes. Tube sockets were typically mounted in holes on a sheet metal chassis and wires or other components were hand soldered to lugs on the underside of the socket. In the 1950s printed circuit boards were introduced and tube sockets were developed whose contacts could be soldered directly to the printed wiring traces. Looking at the bottom of a socket, or, equivalently, a tube from its bottom, the pins were numbered clockwise, starting at an index notch or gap, a convention that has persisted into the integrated circuit era. In the 1930's tubes often had the connection to the control grid, brought out though a metal cap on the top of the tube. This was conected by using a clip with an attached wire lead. An example would be the 6A7 pentagrid converter. Later, some tubes particularly those used as radio frequency (RF) power amplifiers or horizontal delection amplifiers in TV sets such as the 6DQ6 had the plate or anode lead protrude through the envelope. In both cases this allowed the tube's output circuitry to be isolated from the input (grid) circuit more effectively. In the case of the tubes with the plate brought out to a cap, this also allowed the plate to run at higher voltages (over 26,000 volts in the case of rectifiers for colour television such as the 3A3).